Report: Russian Specialists Study Rocket Debris Sighting Over U.S. 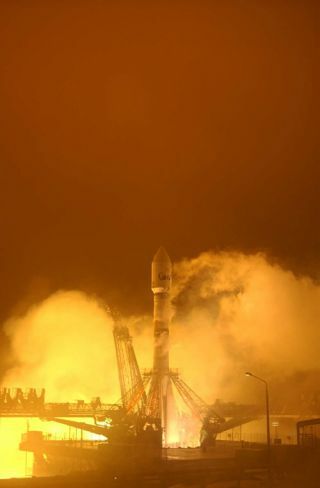 The European planet-hunting observatory COROT launches spaceward atop a Russian-built rocket on Dec. 27, 2006. MOSCOW(Interfax-AVN) - Specialists of the Russian Federal Space Agency (Roscosmos)are studying reports suggesting that pieces of Russia's Soyuz-2 launch vehicle,which blastedoff from the Baikonur Cosmodrome in Kazakhstan on December 27, mighthave fallen on U.S. territory, Roscosmos spokesman Igor Panarin toldInterfax on Friday. "We donot rule out that pieces of the upper stage of the Soyuz-2 launch vehicle mighthave been registered in the atmosphere over U.S. territory. We are analyzingthe information available to us more thoroughly now," he said. There isnothing extraordinary about space junk, including spent rocket stages and spentsatellites, falling on Earth, Panarin said. "Dozensof thousands of space junk objects remain in orbit around Earth. Specialists are monitoring them.Some of them burn up in the atmosphere or fall on Earth every day," hesaid. The mediabuzz surrounding the situation with the Soyuz-2 rocket is unjustified, headded. Therocket's pieces that allegedly fell on U.S. territory cannot be parts ofRussia's Fregat upper stage that placed France's COROTsatellite into orbit on December 27, Panarin said. "Specialistsof the Lavochkin research and development center, where the Fregat upper stagewas manufactured, said that they know the area where Fregat was dumped forcertain. It was dumped into the Pacific Ocean on December 27," Panarinsaid.